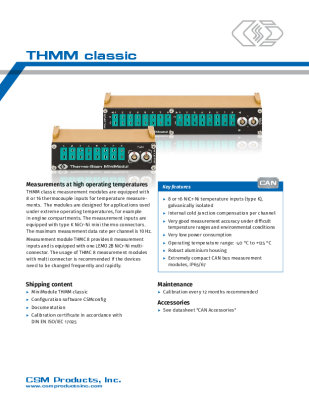 TH MiniModules | CSM Products, Inc. Thanks to the extremely low power consumption, THMM modules have an extremely low temperature drift. 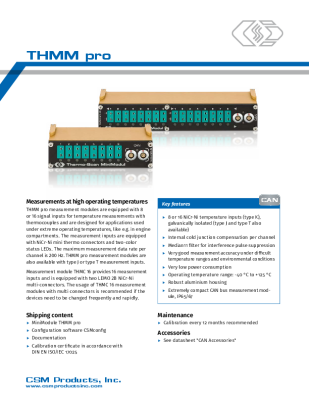 These modules provide highly accurate measurement results over the entire operating temperature range from -40 °C to +125 °C. The compact and robust module housings allow direct mounting in the engine compartment or invisible mounting in the vehicle interior. These modules feature an internal cold junction compensation per channel. The socket contacts are made of the same material as the corresponding thermocouple. This minimizes interferences caused by temperature differences and ensures an extremely good accuracy over the entire operating temperature range.